A dominant appetite for protein drives increased energy intake in humans when the proportion of protein in the diet is reduced down to approximately 10% of total energy. Compensatory feeding for protein is apparent over a 1–2 d period but the mechanisms driving this regulation are not fully understood. Fibroblast growth factor-21 (FGF-21) has been identified as a candidate protein signal as levels increase in the circulation when dietary protein is low. The aim of this randomised controlled trial was to assess whether changes in percent dietary protein over a 4 d ad libitum experimental period in lean, healthy participants influenced energy intake, metabolic health, circulating FGF-21 and appetite regulating hormones including ghrelin, glucagon like peptide-1 and cholecystokinin. Twenty-two lean, healthy participants were fed ad libitum diets containing 10, 15 and 25% protein, over three, 4 d controlled, in-house experimental periods. Reduced dietary protein intake from 25% to 10% over a period of 4 d was associated with 14% increased energy intake (p = 0.02) as previously reported, and a 6-fold increase in fasting circulating plasma FGF-21 levels (p < 0.0001), a 1.5-fold increase in serum triglycerides (p < 0.0001), and a 0.9-fold decrease in serum total cholesterol (p = 0.02). Serum HDL cholesterol was reduced with a reduction in dietary protein from 15% to 10% (p = 0.01) over 4 d but not from 25% to 10% (p = 0.1) and the change from baseline was not different between diets. Plasma fasting insulin levels following the 4 d study period were significantly lower following the 25% ad libitum study period compared to the 15% protein period (p = 0.014) but not the 10% protein period (p = 0.2). Variability in interstitial glucose during each study period increased with a decrease in dietary protein from 25% to 15% and 10% (p = 0.001 and p = 0.04, respectively). Ghrelin, glucagon-like peptide-1 and cholecystokinin were unchanged. 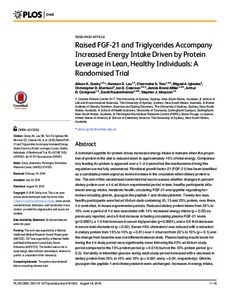 Increases in energy intake plasma FGF-21 and serum triglycerides were associated with reductions in percent dietary protein from 25% to 10% energy over a 4 d ad libitum in-house feeding period and may be important in regulation of dietary protein intake.